Note: The purpose of these posts is to record notes for myself and share information that might be helpful to other artists. If you have any questions, please don't hesitate to ask! When I told people we were driving from Montana to Atlanta, a lot of people thought I was maybe a little crazy. "Have you heard of airplanes?" I was asked more than once, but the fact is that living in Montana means airfare to anywhere other than Las Vegas is not cheap. Most flights to Atlanta required multiple connections and a few flights on small commuter planes, and we were looking at nearly $1,500 just for airfare alone. The next factor was the stuff we wanted to take. With checked baggage rates going through the roof, and shipping costs what they are, sending all of the things we needed to get down there would have cost us several hundred more dollars. We had someone local that we could ship things to, but if you have to ship to the hotel you are staying at, sometimes the hotels charge to receive those packages, so that is something else to consider. We probably came out ahead on our travel and shipping costs by driving, even driving all the way from Montana. We stayed in hotels on the way, and I found those through TripAdvisor. We also used my husband's military ID to get the government rate, so that helped out a lot, too. We could have done the drive in 2 days each way, stopping to sleep every night, but we were already sleep deprived when we hit the road and it took us 2.5 days to get there. On the way back we went a lot slower and did some touristy things, so it took us about 2.5 days again. The other benefit of driving instead of flying is the money we saved on a rental car and all of the things we got to see along the way. If you stay in a hotel at the Atlanta airport, you can also get a 4-day MARTA pass and ride the subway back and forth. This might be faster on days like Saturday, when the Dragon*Con parade clogs up most of downtown Atlanta. I think we sat on the freeway for an hour that morning, just waiting to get on our exit ramp! I also noticed my friends who were limited by what they could bring on a flight tended to have less to sell, which meant they had less profit. If you want to make your money back at a show like this, you really need to have a lot of stuff with you for your customers to choose from. That said, I took too much stuff. Next time I will probably just take things like prints, books, calendars, oracle decks and so on. We took key chains, magnets, mugs, and bookmarks. We didn't have room to display the key chains and while the rest of it did well (we're out of magnets now and nearly out of mugs), I think we would have sold more prints if we hadn't had those items. Something else that really helped was having a vertical display. We ordered 3 2'x7' gridwall panels and had them shipped to Atlanta ahead of us. We got some picture frame hooks that attach to them and slide right through sawtooth hangers and provide a nice solid hanger for wire hangers. We made a lot of sales of large, canvas, and expensive limited edition prints off of this display. For Dragon*Con, you only have a 6' wide table, so this display fits behind it but doesn't leave a lot of room for sitting behind the table. I was worried the 7' panels would be too tall, but I think they were actually the perfect height and maybe 8' would have been even better. A lot of people used panels behind their tables and some of those displays were well over 8' tall. 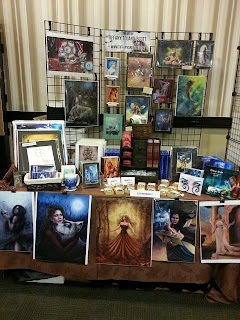 We did get a lot of compliments on the set-up, and by the end of the weekend we had sold out of some things and the table was starting to empty out a little bit. Some of the displays that worked the best were wrought iron easels I got at a craft store years ago on clearance. I've also accumulated a lot of baskets from Ross and the dollar store, which I used for small prints, a little trunk that is just wide enough to stand my 16"x20" prints in and lean back against the lid, and a desk organizer with little drawers to store extra things in and shelves just the right size for extra books and tarot decks. Another little trick is to use bulldog clips to hang prints from the front of your table. Our tablecloth was a little slippery and occasionally a bulldog clip would just give up and drop the print on the floor, but it was a very short fall and everything was fine. 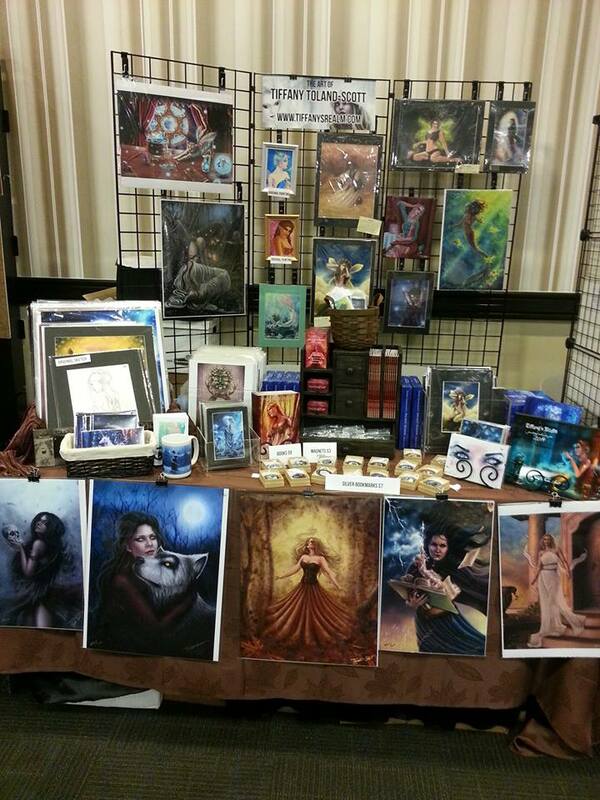 We also sold almost all of the prints on the front of the table. A lot of people use that space for signage but I think 16x20 and 12x18 prints make much better signage, plus you can sell them! The one thing I did forget was price tags, and then I accidentally bought clear ones at the office supply store, so most people couldn't see them anyway. Oops. Dragon*Con Part 2: So. Many. People.